Prompted by the success of the original Scratch Map, we got together with the creative heads at Luckies of London to create a new travel edition version. The miniature map is still as cool as its predecessor but cuter in every way. 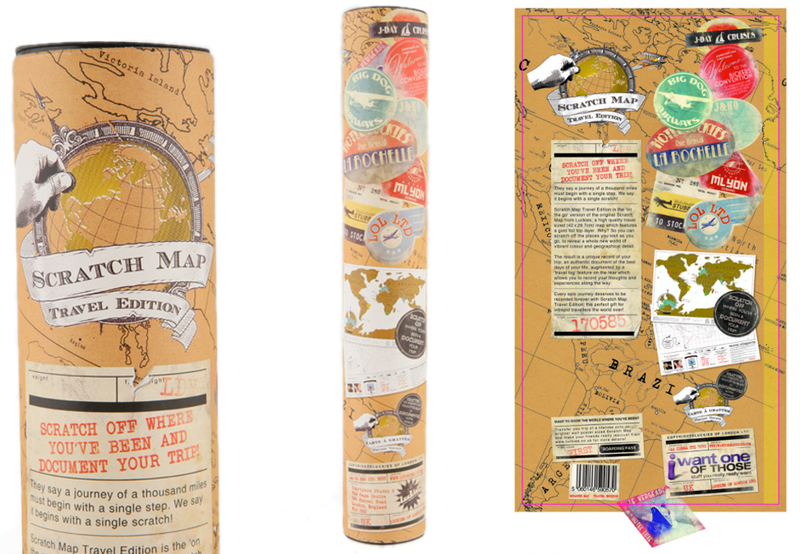 It makes the best present for any globetrotter as the map (in its sturdy tube) fits into your rucksack without taking up too much valuable room. This is a unique world map that you can personalise based on the countries you have visited. Now you have the choice to choose between a handy travel size version, or the original larger version. For those of you new to the Scratch Map, it is a map that you scratch off the countries you have visited to reveal gorgeous geographical detail underneath. It is a good way to show how well-travelled you are and a great way to remind you of oversees experiences. An ideal gift for the backpackers and globetrotters among you. The top layer of the map is made of gold foil for easy scratching. Rub it with the edge of a coin, scratch-card style, to reveal the colourful detail underneath. This map is a great talking point wherever you might hang it, let people see how very Palin-esque you are. This unique version of the map is smaller and cuter in every way! - R.K. Imagine being able to subtly show off exactly where you've been on your holidays. With the Scratch Map, it's easy to make anyone who pops round feel jealous of exactly how well-travelled you are. On first glance, it's a quite classy looking wall map, but if you carefully scratch off the places you've been on holiday, it reveals some lovely colourful and geographic detail. More importantly, it's perfect for letting everyone know how exotic, learned and very Palin-esque you are. The top layer of the map is made of gold foil for easy scratching; you only need to rub it with the edge of a coin, scratch-card style, to reveal the gorgeous detail underneath. This makes a super gift for anyone who's clocked up a few air miles in their time. This is a great talking point for wherever you might hang it. The only problem might be the excessive amounts of money you'll have to spend on trotting around the globe so you can finally reveal that missing patch of Belize or Inner Mongolia that you so desperately want to see the detail of. Palin's one would be amazing - now there's a goal to work towards.